Besides Axis, What Manufacturers Support Corridor Mode / 9:16? What manufacturers, in addition to Axis, make cameras that support Corridor mode or 9:16 format? Good question, I know a few VMSes let you dynamically rotate cameras 90 degrees on the display, essentially providing 'corridor' mode on demand. 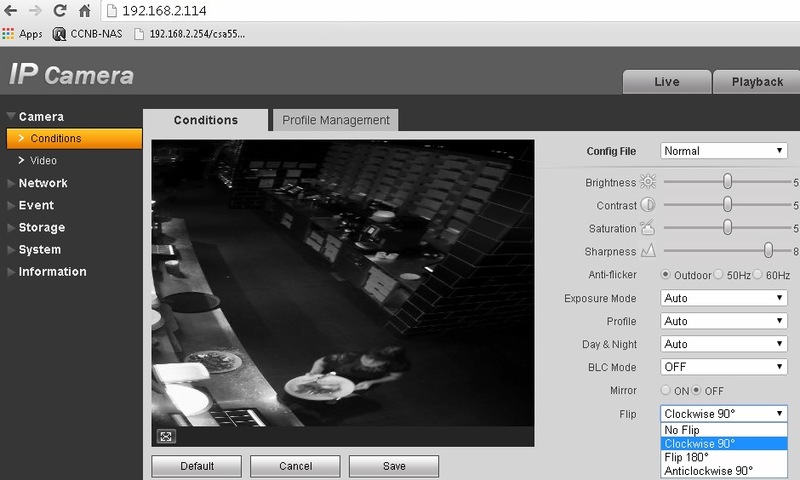 Network Optix is one example, see the aspect ratio section of our VMS live monitoring test.  I cannot recall other camera manufacturers marketing this but I have to imagine someone does as it is not rocket science to allow your camera to be rotated 90 degree, especially since almost every camera supports flipping and mirroring. P.S. - Axis indicates that they have a trademark on the term 'Corridor Format' so presumably anyone else supporting such a rotation will pick a different marketing term. Is that camera side or VMS side or? This is wrong. We confirmed via testing and with Avigilon that this is VMS side. EverFocus 1000 series mini-cameras line supports "Hallway Mode" on the camera side. Here is the user's manual for the EZN mini-bullet in PDF. It's on page 24. Some Dahua cameras also support 90-degree clockwise or counterclockwise rotation (oddly, there's no 180 rotation, only a "flip" option that must be complemented with the "mirror" setting to get an upside-down image the right way up). They don't call it "hallway mode" or any sort of marketing bafflegab, just give a "rotate" option. In this case, the VMS doesn't have any control over the camera, it just accepts the stream as it's sent. Honestly, I don't think this is a very unique feature anymore... sorry, Axis. I can tell you that with a firmware update release available any day, the American Dynamics Illustra 1MP and 2MP Compact Minidomes will support 9x16 corridor mode with no loss in FPS. Our VideoEdge VMS also includes a number of layouts that include display of the 9x16 format streams. Thanks all. This has been very helpful. It seems manufacturers believe this to be catching on nicely. I've been hoping this feature to catch on more widely, but it is not yet available in some of the brands I work with. One work-around is to use two rectangular rivacy masks, one on either side, and use the camera at full resolution and set your focal length to wide. For example, this would turn a 1920x1080 camera into a 1080 x 608. I am sure it works, if you want to cut your resolution by 66%! 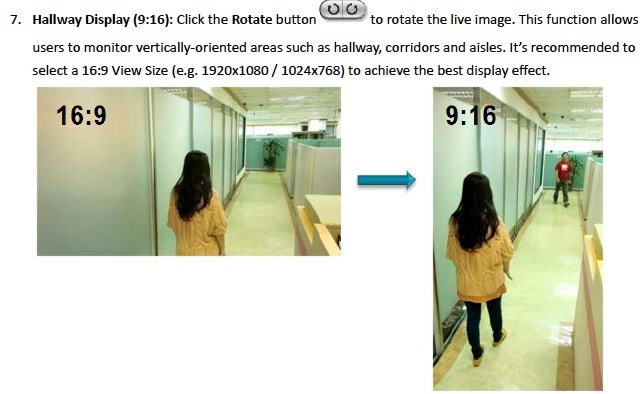 Bosch IP Cameras support corridor mode / 9:16 format. Which ones? All of them? Starting with a specific firmware release? Yes, that is the beauty of common product platform (CPP4) that all Bosch IP cameras run on the same platform together. I checked an NDN-733 fw 5.85, and I can't find this feature. I can't find a 90 degree rotate option. All I find is that stream 2 can be set to "upright cropped", which gives 9:16. but uses only part of the sensor. Are you saying there is a way of using full sensor rotated 90 degrees? B, sorry for the delay. Bosch does not currently support true corridor mode. 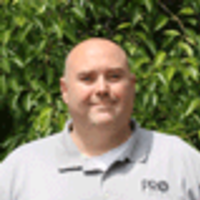 One has to crop / reduce resolution to get a 9:16 aspect ratio. Bosch says a future firmware release / new series may resolve this. Samsung WiseNet3 cameras will support 90 degree rotation (it's correct, they will not use the word "corridor"), in the next firmware release next month, it will work backwards on all existing WiseNet3-models. We have recently been in touch with Samsung, and they claim that none of their IP cameras (WiseNet3 or otherwise) support corridor mode or 9:16 aspect ratio. If you have seen otherwise, please, let us know! Update: We are going to include corridor mode as a field in our Camera Finder, which means you will be able to limit searches to cameras supporting corridor mode as well as see it in our results, etc. This should be live in the next few weeks. Anyone with any other info to share on other manufacturers supporting corridor mode should share here. 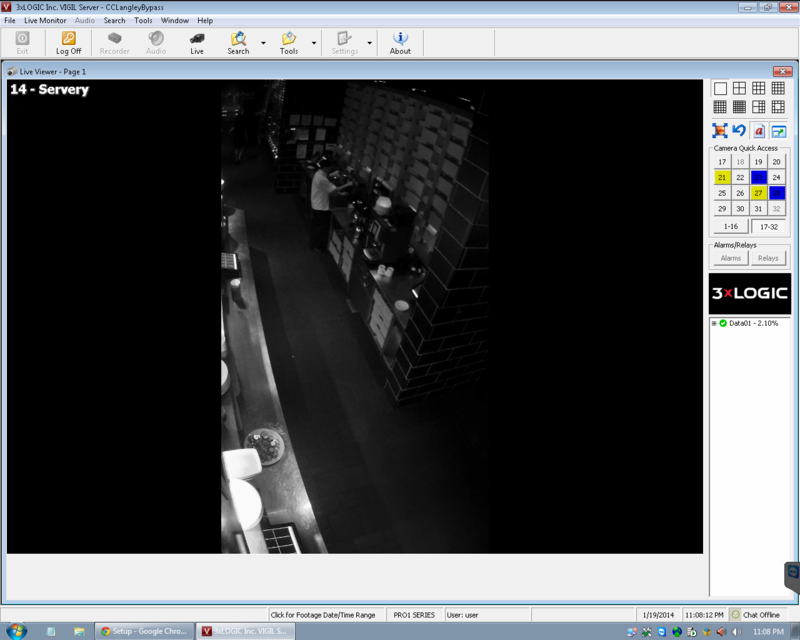 We have used corridor mode on the 2532 HikVision cams in conjunction with DW Spectrum and it works pretty good for us.